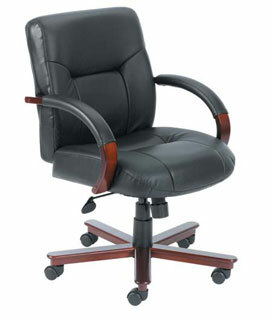 Price per Unit (piece): $292.50 Beautifully upholstered in genuine Black Italian Leather. Passive ergonomic seating with built-in lumbar support. Matching hardwood arms with tailored leather padding. Mahogany finish on 27″ base. Hooded double wheel casters. Upright locking position. Pneumatic gas lift seat height adjustment. Adjustable tilt tension control. Elegant finish on hardwood arms and leg caps. Overall Size: 27″W x 28″D x 26.5″-30.5″H.